The Shingled House: Linocut and Printing Fabric! 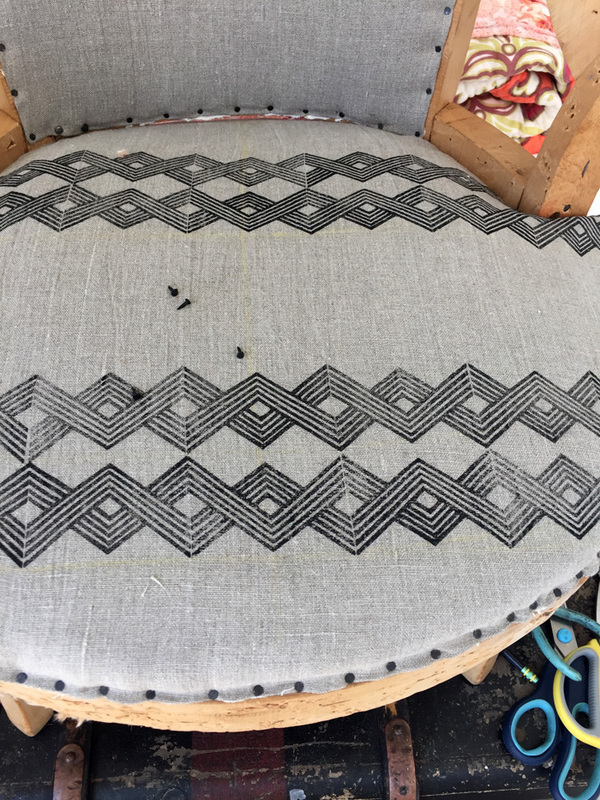 Things have been proceeding just swimmingly here on my boudoir chair reupholstery project. (This is why this post title is written with an exclamation point!) 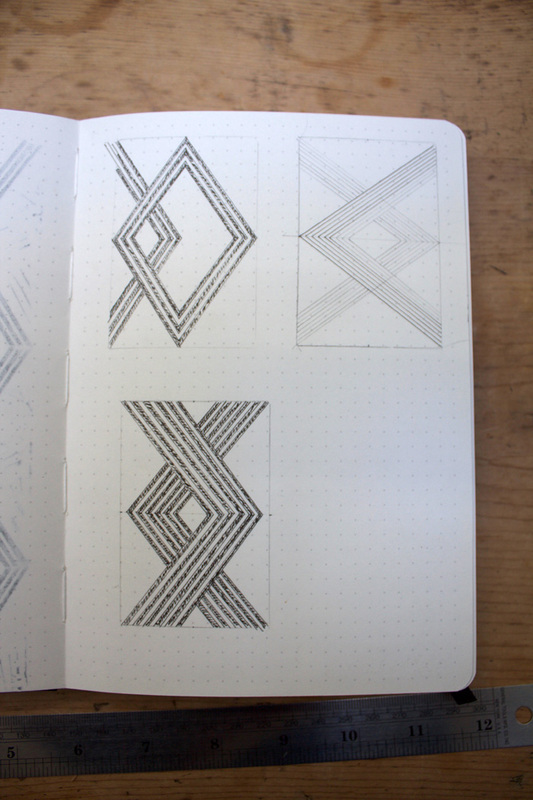 Last week found me completely engrossed in creating a repeat pattern and making a linocut block. 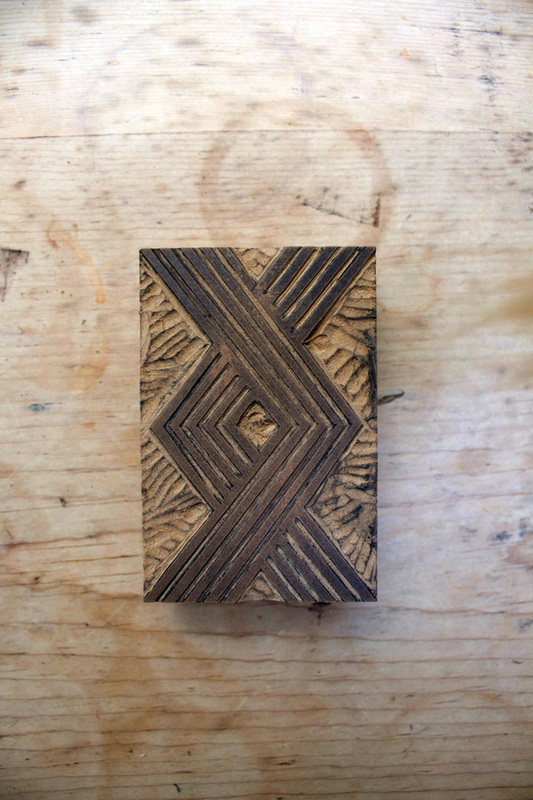 First things first though, I bought a Speedball linocut starter kit and some 2x3" blocks. 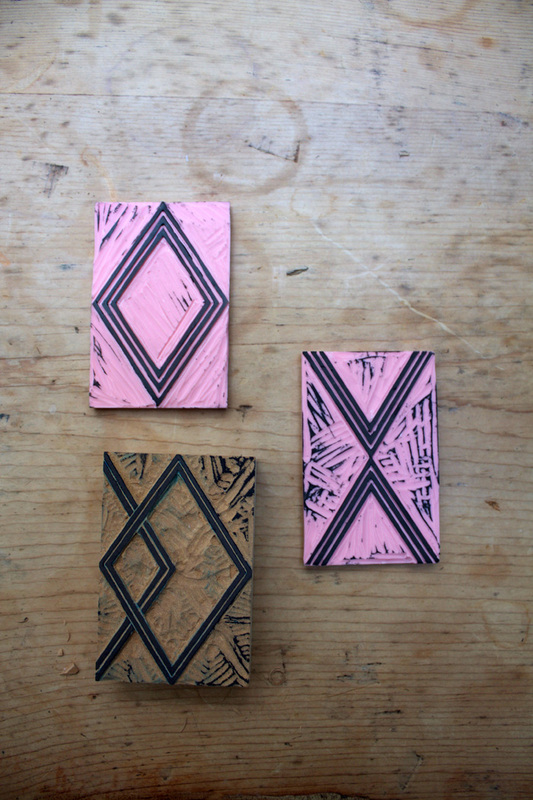 I bought both the traditional board backed linoleum block and some of the softer pink Speedy Cut type. I bought both because my only real recollection of linocutting must be from like grade school, when I found that it was friggin impossible to cut at all, never mind with any precision. On the other hand, the softer types, I read, can be prone to crumbling and I was going to be trying to cut some thin crisp lines. I must say that I love a project in which the process becomes a major distractor to the stresses and doldrums of daily life. I found myself thinking about patterns while falling asleep at night, when waking in the morning, while driving to and from school every day, and while plodding through many other boring daily chores (laundry anyone?). Even with all this pondering and drawing, it took me some time to grasp spatially how to set up a pleasing repeat pattern for block printing. *A running pattern is the easiest to do well. *Patterns look good when it appears that one line crosses over another -this gives it some 3-dimensionality and cohesiveness. *Patterns look good when there are no hanging endpoints. i.e. the pattern closes in on itself. *Negative space can also create pattern and impact the positive space pattern. 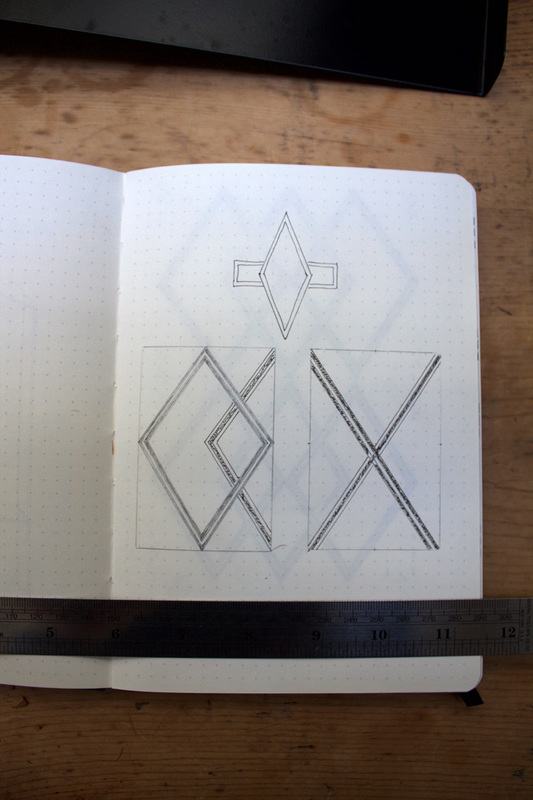 *Basically any rendition of an X works great for block printing a running pattern because it intersects itself and starts and stops in the same place on the top and bottom edge, which also creates the secondary part of the pattern. 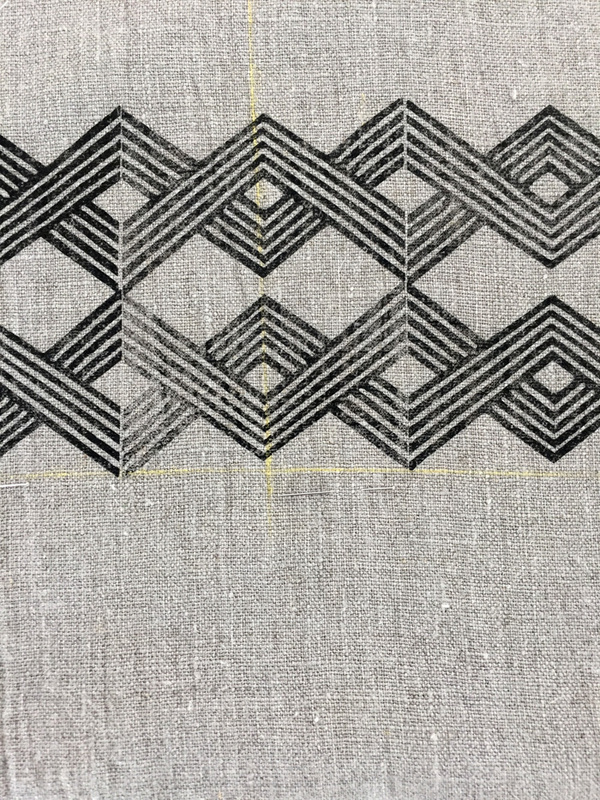 When I finally came to make this block, I was very careful to have the two sections of five lines line up with each other, so that I could flip the block back and forth and mirror the pattern. 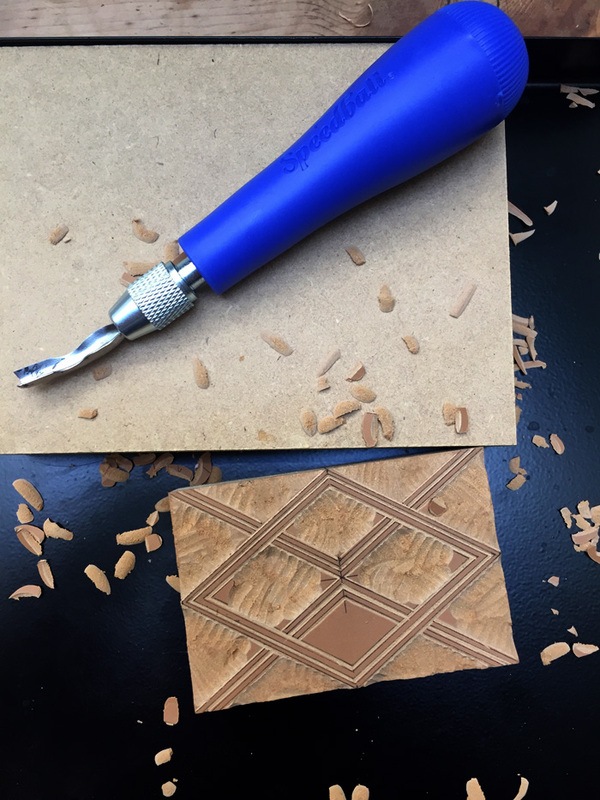 I found that the harder traditional linoleum cut more precisely than the pink stuff (which moved too much when pressure was applied in the cutting process). I did not have any trouble with crumbling. Getting just the right amount of ink on the block took a little practice. Too much is a disaster, too little is still ok. I found that it was helpful to completely wipe down the block after about 5 or 6 imprints, because the ink picked up a lot of random fine fibers from the fabric. I think a bit of variety in the amount of ink looks good. Chalk lines which wipe away worked great for maintaining relatively straight lines. That being said, the whole point of block printing is that it has an organic quality, so perfection is really not a must. 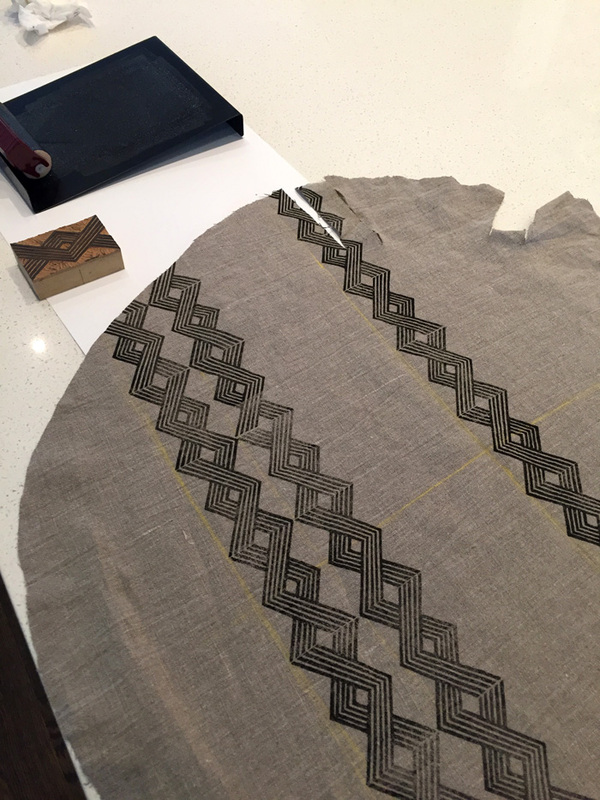 I always started my pattern in the middle and moved outward. As I stated previously, I flipped the block back and forth as I printed so that the two lines of pattern also formed a pattern themselves. 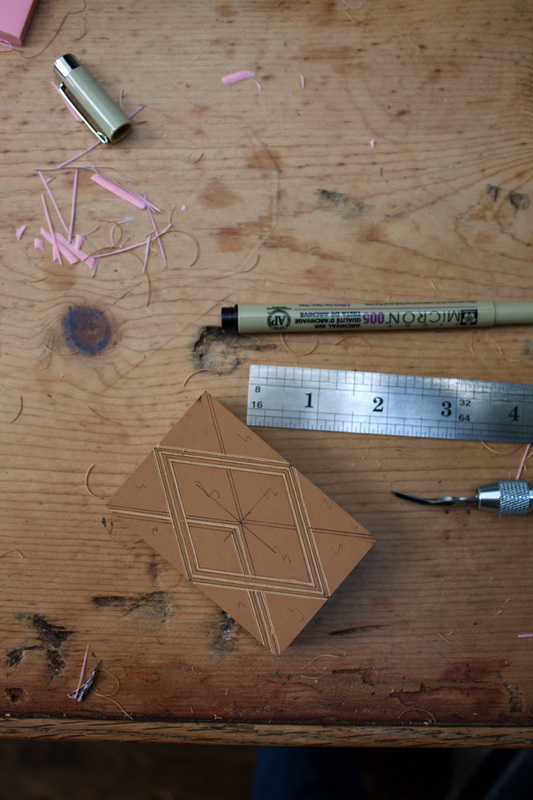 Currently, I am very excited about all things linocut. I absolutely want to do some more textile projects in the near future -I'm thinking of printing on very faded small print or striped fabric. Here's a little tease of the chair. I'm still tacking and still need to make the pillow top. Little and often wins the race.